Here is page 91 of Hazardous Tales #5 in progress. 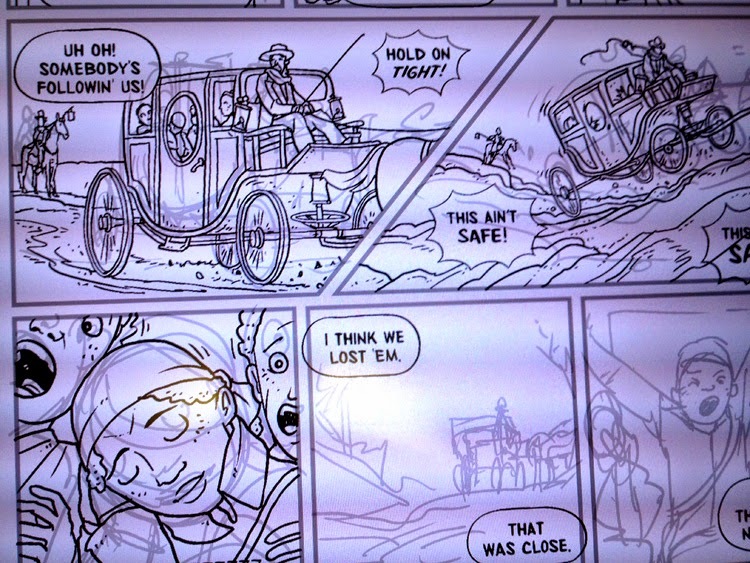 I don't love drawing cars--and I have trouble with horses, but boy, do I love drawing carriages! Figure that one out. The subject matter of book #5 is still somewhat under wraps. This book comes out next spring, so we'll have a subject and cover reveal later this fall. I don't think there are any giveaway clues in this image, other than the fact there will be a carriage in it. I am deep, deep into this book right now. I have 37 pages to draw and color in the next sixteen days. This is the real grind. I've been working on the book all summer long, but here, in the final weeks, is when the crunch really hits. I'm now in full reverse sleep mode (work through the night, sleep from 8am to 3pm--while the kids are at school). It's a silly schedule. But it works for comics crunch time. I like the way you have avoided drawing the horses pulling the carriage. I can't wait to see what it is all about.